Wednesday - in the kitchen Recipe | A.B.E. Remodeling, INC.
Hi all, it's Wednesday (night) in the kitchen try a new recipe. If you love peaches, this one looks inviting to the tastebuds. Didn't yet try it myself...but it's on the list. Hope you enjoy this share that came through on Facebook. If you try it.... let us know the results. ANY ONE FOR A SNACK........ A Peach Cobbler SNACK CAKE ???????????? Spray an 8-x-8-inch baking dish with nonstick spray. Preheat oven to 350 degrees F. In a small bowl, combine 3 tablespoons sugar and corn starch. Toss peaches in the mixture and coat evenly. Set aside. In a medium bowl, sift together 1 cup sugar, flour, salt and baking powder. In another bowl, whisk together milk and butter. Slowly pour wet ingredients into dry ingredients and stir until incorporated. Pour cake batter into prepared baking dish. 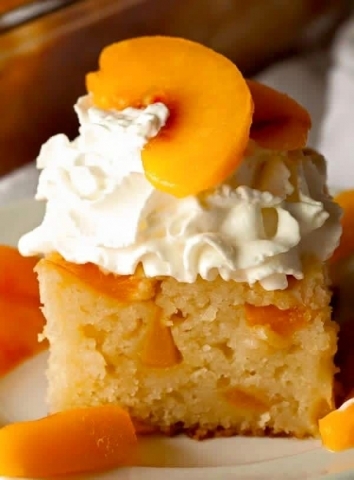 Press sliced peaches into the cake batter and place some on top. Put in the oven and bake for 50 to 55 minutes or until a toothpick inserted in the middle comes out clean. Love this with fresh whipped cream on top. Are you hungry for Fresh Peaches!! Yum. ENJOY YOUR DAY.